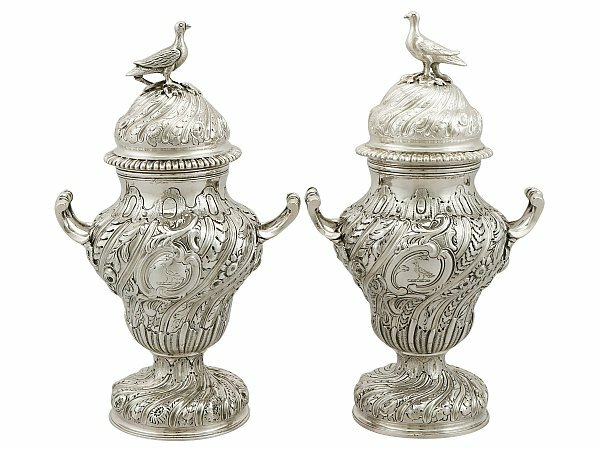 These exceptional antique sterling silver condiment vases have a baluster shaped form supported by a pedestal and domed circular foot. The body of each vessel is embellished with exceptional chased concave fluted decoration alternating with bands of tiered leaf designs and floral sprays, all in a swirl design. These antique Georgian vases are each ornamented with two scroll bordered cartouches, one displaying the contemporary bright cut engraved crest of a dove and the other featuring a corresponding coat of arms. The lower portion of each piece is embellished with a continuation of chased fluted ornamentation segmented with an undulating border and divided with a simplified leaf texture. Each piece is further embellished with a shaped band of leaf ornamentation to the upper portion, subdivided with plain oval panels. These silver condiment vases retain the original plain domed push fit covers encircled with further chased decoration reflecting the same design as that to the body and an applied gadroon decorated border to the rim. The covers are each surmounted with the original and exceptional cast sterling silver finials depicting a dove; the ornamentation to the feature finials reflects the heraldry markings. Each piece has two fine and impressive scrolling handles accented with a leaf design to the centre of the handpiece and leaf decorated terminals in junction with the body. The pedestal of each item is embellished with chased decoration, reproducing the design to the body and cover. 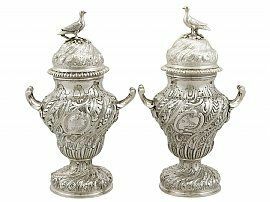 These antique silver condiment vases are an exceptional gauge of silver, exceptional quality and in exceptional condition. Full hallmarks struck to the underside of each vase are all very clear; the hallmarks are struck deeply due to the exceptional gauge of silver. The part hallmarks to the sleeve of the cover have wear in keeping with age and location, but remain legible.